전 고종 패옥(稗高宗佩玉)은 고종황제가 사용하던 것으로 전해지는 패옥이다. 패옥은 왕·왕세자·왕세손·백관의 제복(祭服)과 조복(朝服), 왕비·왕세자비·왕세손비의 적의(翟衣) 양 옆에 늘어 뜨리는 것이다. 옥으로 만들었기 때문에 옥패 혹은 패옥이라고 한다. 좌우 2개가 같은 모양을 하고 있으며, 가장 위에는 구름모양의 옥이 달려 있는데, 밑부분에는 5개의 구멍이 뚫려있고 윗부분에는 2개의 구멍이 뚫려 붉은색의 비단실로 꿰어 있다. 윗부분의 실은 색동 공단의 윗부분에 고정되었고 밑부분의 실에는 옥구슬이 꿰어져 있다. 그 밑으로는 긴 사각형의 옥판에 구멍을 뚫어 두번째, 세번째, 네번째 줄에 연결하였고, 첫번째, 다섯번째 줄에는 엽전모양의 옥판을 반으로 갈라 마주보게 꿰어 놓았다. 그 밑으로는 계속 옥구슬이 연결되어 있는데, 첫번째, 다섯번째 줄에는 세로로 긴 사각형의 옥판이 달리고 두번째, 세번째, 네번째 줄에는 바로 위의 것과 같은 형태의 옥판이 달려있다. 그 밑으로는 다시 옥구슬이 연결되고 마지막에는 각줄마다 하나씩 옥판이 달려있는데, 중심인 네번째 줄에는 제일 윗부분에 있는 구름모양의 옥판과 같은 모양의 것이 달려있다. 패옥의 뒷부분에는 4가지 색으로 짠 소수가 달려있는 4색의 색동공단이 대어져 있다. 색동공단 아래에는 매듭으로 짠 조와 술이 달려 있는데, 이 조와 술도 색동공단과 마찬가지로 4색으로 배열되어 있다. This pair of jade pendant is assumed to have been worn by King Gojong. (r. 1863-1907). 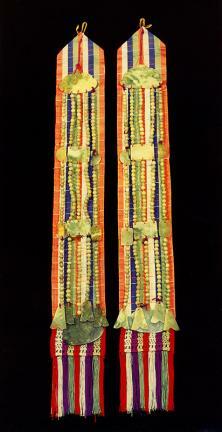 Jade pendant is an accessory attached to each side of the robe. The King wore a full royal dress when visiting the royal ancestral shrine and the altar to the guardian deities of the State as well as when meeting the retainers during their regular morning visit to the king. The pair of jade pendants is identical in shape. At the head is a cloud-shaped jade, which has two holes above and five holes below. A piece of red silk thread runs through the two holes above. The upper thread fixes the upper part of the multicolor-striped silk satin. The lower thread goes through the jade beads. Hanging from the holes below are five pieces of threaded bead strings. The second to fourth strings hang two rectangular jade slabs together. The first and fifth strings hang each half of the coin-shaped jade and further below as well as a small, rectangular jade slab each. Every string hangs a piece of jade slab at the end. The fourth string at the center hangs the same cloud-shaped piece as the one at the head. The back of the jade pendant is lined with four-color silk satin. Under the satin, knotted tassels are arranged in four colors as with the four-color silk satin.